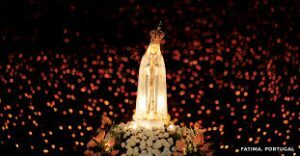 The Centennial Pilgrim Statue of Our Lady of Fatima, blessed by Pope Francis on 11th January 2017 will arrive at the Grotto, Ballinaglera, Co. Leitrim, on Sunday 19th March at 6.00 pm with outdoor procession to the Church and public Rosary. Mass will commence in St Hugh’s Church, Ballinaglera at 7.00 pm, including consecration of homes and families to the Sacred Heart of Jesus and the Immaculate Heart of Mary. Enrolment in the Brown Scapular will take place at the end of Mass. Liturgy will conclude with Benediction of the Blessed Sacrament, with a period of time set aside for private prayer and veneration.